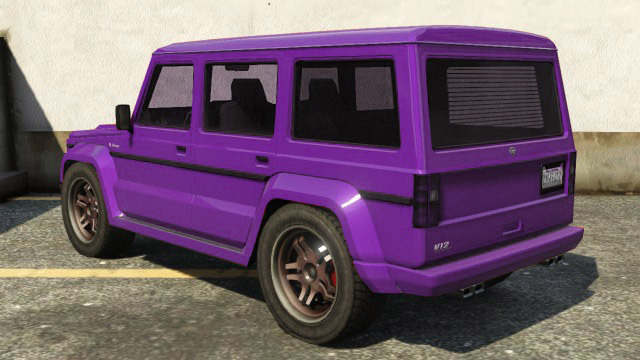 The Benefactor Dubsta is a four-door SUV in GTA 5. The Benefactor Dubsta features classic European styling and features many elements that bear strong resemblance to a Mercedes Benz G-Class 463. More precisely, a G65 AMG, as the car has a V12 engine. However, the in-game version has a 6.5L Supercharged V12, where the real life G65 AMG has a 6.0L BiTurbo V12. The overall styling is very square, putting emphasis on its off-road purpose in favor of appearance. The Benefactor Dubsta features a high displacement engine, presumably a V12-engine based on the badge on the back, but sounds more like a American V8-engine. This is sent through a permanent four wheel drive system, and then finally through large, high profile tyres to the ground. The Benefactor Dubsta is one of the most capable off-roading SUV’s in GTA 5. There is a modified version of the Benefactor Dubsta that spawns at the meeting points for Off-road truck Races which sports certain modifications that are not available at Los Santos Customs. This variant has the same performance stats as the regular Dubsta, but all of the trim and chrome details have been blacked-out. This model also features more shallow roof indentions and a black bull guard. The design details of this variant seem to be inspired by the Mercedes-Benz G Class models modified by the aftermarket tuning company Brabus.The Benefactor Dubsta‘s spiritual successor is the Dubsta 6×6, which itself is an off-road vehicle, with extended wheelbase and consisting of having 6 wheels. The Dubsta seen in the mission Trevor Philips Industries. Commonly seen all throughout Los Santos. Blacked-out variant usually spawns at the Offroad Races’ meeting points. in GTA Online, may be seen driving through the streets of Los Santos.